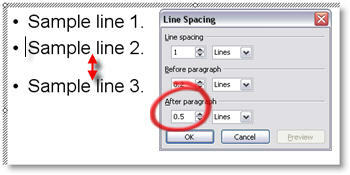 What Does Line Spacing Do? Here is a sample three lines of text and the default line spacing dialog. If I select the entire text box and change the LINE SPACING all of the lines move further apart as you can see here. If I place the cursor in line 2 and add BEFORE PARAGRAPH space, the distance between line 2 and line 1 increases. The distance between line 2 and 3 remains the same. If instead I place the cursor on line 2 and add AFTER PARAGRAPH space, the distance between line 2 and 3 increases. While the distance between line 1 and 2 remains the same. Where are the File Properties in PPT 2007?